ROTARY Club of Macquarie Park have donated $10,000 to local organisations from funds raised at the successful Light Up East Ryde event last November. 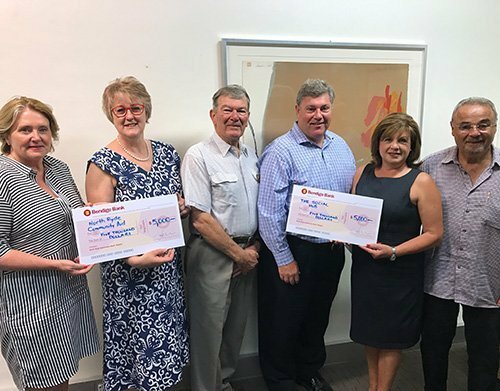 North Ryde Community Aid and The Social Hub received $5000 cheques respectively from Macquarie Park Rotary president David Malone at a recent presentation. Steve Lightfoot accepted a cheque for The Social Hub on behalf of Marcella Letteri while Executive Officer Helen Crouch accepted for North Ryde Community Aid. In line with community spirit, Kathleen Synnott from BresicWhitney Real Estate and a foundation member of Macquarie Park Rotary, was the major contributor to Light Up East Ryde. Over 3,000 locals enjoyed the night with local entertainers led by MC Roseanna Gallo and more than 60 Christmas market stalls. Macquarie Park Rotary were in their element hosting a fundraising sausage sizzle and selling raffle tickets on the day. At BresicWhitney, their company motto is “bringing homes to life.” With Light Up East Ryde, a whole neighbourhood was brought to life on the night! Kathleen thanked the local community and all sponsors who made the event possible and Light Up Committee for their months of organisation in preparation for the night. “Thank you to our BresicWhitney, Foundation sponsors and major sponsors including Rhapsody Studios, Bendigo Bank, Kwik Kopy North Ryde, City of Ryde, Delitalia, Cox’s Road Mall, New Horizons, Spa Dental, Lady Ann Funerals, North Ryde RSL, Driessen Insurance, Eastwood Superfresh, Midway Cellars, Bunnings Artarmon, Helloworld Top Ryde and Chas Clarkson Christmas shop; Kids Zone sponsors Boronia Bakehouse; LCU Banking North Ryde and Vision Personal Training North Ryde who jointly sponsor the Petting Farmyard Animal Zoo. 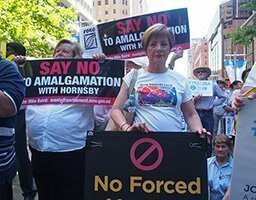 PICTURED Kathleen Synnott of Bresic Whitney; North Ryde Community Aid Executive Officer Helen Crouch; Rotary Club of Macquarie Park President David Malone; Steven Lightfoot of The Social Hub and Bresic Whitney’s Angelina Bonifacio and Robert Churi.